Mixing the traditional with other elements can have great results: Aerosmith joined Run DMC to make "Walk This Way", and Avatar combined real actors with animation to entertain you with...crappy 3-D glasses! 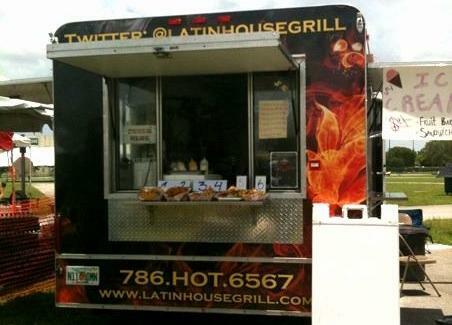 For a Tex-Mex food truck mixing things up, track down Latin House Grill. LHG's a mobile foodery dishing decadent grub that employs Tex-Mex as a base, but's deliciously augmented here and there by elements of other cuisines, all set up in a kitchen-rigged trailer done in slick black with flames on the outside and diamond plate -- how better to make the food seem n-ice? 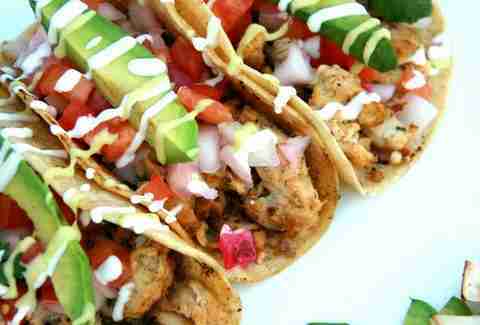 Tacos're stuffed with your choice of meats ("Philly-style" ribeye, chicken, or carne asada), and come in two versions: traditional taqueria-style on a soft corn tortilla with pico, garlic crema, sauces (cilantro-citrus & habanero-mango), and fresh avocado, plus a non-traditional (where the tortilla is flash fried 'til light and flaky) called the Puffy Taco, enough of which'll cause you to sing "I'll Be Missing You" to your toes. Non-tacos include the Flatton, a flatbread sandwich topped with melted provolone, Swiss, and mozz and piled with grilled onions, 'shrooms, avocado, and any meat; a ChimiBurrito that combines fluffy spiced yellow rice, meat, pico, and avocado before being rolled and fried; and chips loaded with mozz/Provolone/Swiss, meat, and loads of sauces, dubbed the Sneaky Nachos, which can only be stolen by fat burglars. Latin also does a burger (an 80/20 blend of brisket and chuck steak) done up w/ their three melted cheeses, grilled 'shrooms & onions, creamy cilantro sauce, avocado, potato shavings, and spicy mayo, named the Madlove -- exactly what everyone had last year at the Oscars for James Cameron's...ex-wife!